Bushman AvonTec, Milwaukee, WI, has developed the Coil-Trac coil-tracking system that tracks slit coils as they pass through each station of a packaging line. Coil-Trac is flexible and can be tailored to meet the specific needs of each customer and packaging-line configuration. 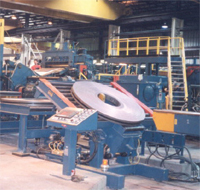 Coil data and customer specifications are manually input as coils enter the packaging line. The system can collect a variety of key data such as customer identification, lot numbers, coil weight, required skid type and spacer patterns. facilitates efficient processing decisions and tasks, and allows for real time record updates. It provides for seamless transfer of physical coils and their accompanying data. An operator can view the data on any coil at any time and at any location. Bushman AvonTec designs and manufactures material-handling equipment in three product segments: below-the-hook lifting attachments for cranes, including C-hooks, coil grabs, spreader beams, sheet and plate lifters and lifting tongs; floor-based equipment such as scissor-lift tables, upenders, inverters, die carts and transfer cars; and slit-coil packaging lines for metal-processing facilities. See also: Bushman Equipment, Inc.